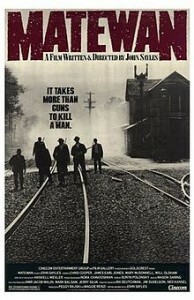 The Town of Thurmond was used in the filming of the movie Matewan in 1987. The film, written and directed by John Sayles, illustrated the events of a coal mine-workers strike and attempt to unionize in 1920 in Matewan, a small town in the hills of West Virginia. John brought his crew to Thurmond and transformed the streets back in time. Locations used were the Historic Thurmond Train Depot, the main street of Thurmond, the Thurmond Union Church and the boarding house. Several Fayette County residents were cast as extras in the movie.